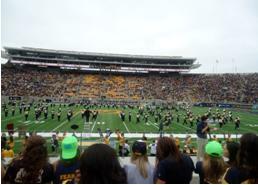 2 December 2013:While many may assume that the opportunity to study at America’s number one public university would naturally be a challenging yet enlightening experience, it often comes as a surprise that the greatest challenges I found during my year at the University of California Berkeley were not academic. I was blessed to bear witness to some of the greatest political developments in American history and sought to take full advantage of the position I was in by getting involved in many events and projects. Shadowing campaigns, encouraging people from the African-American community to vote, highlighted to me what the re-election of President Barack Obama meant to this group of Americans. Leading up to the general election, the stark contrast in attitudes between the black community in England and America expressed how Barack Obama marked a new step for their community; the acceptance, equality and recognition they had sought since emancipation. Once the George Zimmerman verdict was passed in Florida—where he was found not guilty for the death of unarmed black 17-year-old Trayvon Martin—I attended a march in the neighbouring city of Oakland and shared the pain of the black community, born from the realisation that there was still a long journey on the road to equality in the U.S. During Iftar at the Afro House (breaking of fast during Ramadhan), I learnt how much of an influence African-American culture had over the way young black students perceived their purpose in life. Many considered themselves future leaders of their community, who had to use the privilege of having a college education to uplift their community from a history of cases like Trayvon Martin’s, disproportionate incarceration and chronic poverty. Walking in solidarity with the San Francisco AIDs Foundation at San Francisco’s Gay Pride parade after the Supreme Court declared ‘Proposition 8,’—a constitutional amendment that stated only marriage between a man and a woman is recognized in California— unconstitutional is a memory I will carry with me forever. Seeing complete strangers coming together to celebrate with and support a couple who had just received legal recognition of their 40 year marriage was an extremely uplifting experience, restoring my faith in altruism. I formed strong bonds with many of my professors, whose classes enriched my experience in America and allowed me to reflect on texts I had analysed in the first two years of my undergraduate degree from a whole new perspective. To be on a first name basis with some of America’s most established academics is one of my proudest achievements, and strongly encourage other ACD students to do the same. As I progressed throughout the year, the lack of regard to addressing the social struggles I discovered, removed the rose tinted glasses I once viewed ‘the land of the free’ through. 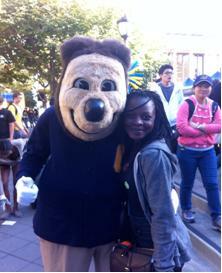 I will always be a Berkeley bear at heart and feel honoured to have been part of the community for a whole year. However, the struggles I would have endured to get there if I was a low-income American student was the greatest moral challenge I came to face. At the end of my year, I was fortunate enough to secure a work placement, working with the UC Berkeley Early Academic Outreach Programme. 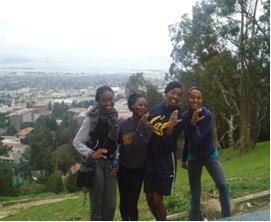 The students I mentored were from some of the most deprived communities in the Bay Area. The description of a ‘lockdown’ experience at an East Oakland high school astounded me as I could not even imagine the prospect of firearms being brought onto school premises. Meeting these students also showed me how prevalent the lack of social mobility is in America. Connecting with the communities beyond the boundaries of the university allowed me to recognise how important programmes like African & Caribbean Diversity are to gifted students all over the world and made me proud that I had the opportunity to give back. As I reflect on all the wonderful things I have taken away from the 365 days I spent assimilating into American culture, the only regret I have is my refusal to eat deep fried butter.